Technical competency alone does not guarantee professional success. To succeed in today’s complex project environments, ‘People Skills’ are essential for IT professionals. 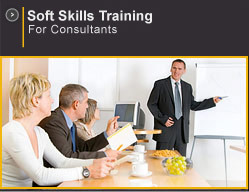 OTA’s Soft Skills seminars help IT consultants and in-house personnel increase their overall effectiveness when dealing with the people and organizational dimensions of projects. Case studies and project simulations ensure that the skills carry over into real life applications. OTA seminars can be customized to meet specific professional development requirements. This one-day workshop introduces newly hired consultants to the role(s) they can expect to play in large IT projects. The focus is on fundamental consulting skills, such as managing expectations, building trust, questioning and probing. It takes more than product knowledge to make an effective consultant. Designed specifically for professionals working on enterprise projects, this seminar allows participants to expand their customer interaction skills and have a greater impact on project success. Interactive workshops, real-life examples and simulations focus on proven techniques to maximize value to the project and the organization. Designed for Account Team members (sales professionals, lead consultants, project managers, etc.) involved in the selling of IT services, this workshop helps participants articulate a unique value proposition that meets the specific requirements of their customers and prospects. The processes, techniques and deliverables are complemented by lessons learned, best practices, tips, tricks and simulations on services opportunities. Course materials can be customized to fit with the organization’s existing sales methodology. This highly acclaimed workshop helps IT and management consultants build up their confidence and performance when being interviewed for consulting engagements. Experienced instructors introduce a proven Interview Success Model (Connect / Content /Convince), that participants can immediately apply to develop their own reusable personal value proposition. Heavy emphasis is given to practice and skills development; each participant being involved in several simulated interviews, face-to-face and over the phone. 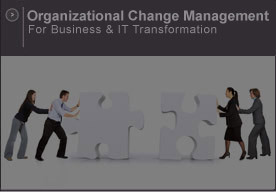 Successful IT professionals have the ability to build rapport, transfer knowledge and influence the client organization. This two (2) day seminar helps participants establish credibility and communicate more effectively, both formally and informally, in project-related situations. Emphasis is on practice, with the participants delivering a variety of presentations in various project contexts. The seminar goes beyond presentation skills to address issues related to group facilitation, consensus-building, objection-handling and resistance to change. The approach used has the participants deliver several presentations in a variety of contexts (i.e. sales support, project kick-off, etc.). Presentations are videotaped and each participant receives group and individual coaching from the class and the instructor. In today’s complex project environments, partnering is critical to success. However, establishing successful partnerships, be it with customers, suppliers or team members, calls for effective conflict and negotiation skills. This workshop focuses on common project conflicts over scope, resources and commitments. It introduces a simple framework that helps participants understand their interests, as well the other party’s interests, and then determine the negotiation options available to them. The seminar builds on the participants’ own experiences to review core project leadership concepts, tasks, techniques and deliverables as they apply to large IT enterprise projects, especially those involving enterprise software. Emphasis is on the leadership and people skills expected of project managers and team leads. Leadership skills are covered in the context of the phases of an IT project. The seminar can also be customized to integrate/reinforce the organization’s existing project methodology. Common people and organizational risks at each phase of a project are described and participants are given the opportunity to discuss proven preventive and corrective actions for applicability to their own projects. The organizational challenges of projects are also covered, such as: decision making, fostering client ownership, managing expectations and the adoption of organizational change. Participants are encouraged to assess their skills and produce a personal development plan. This workshop focuses on the knowledge and skills required of senior IT consultants to succeed in the role of Team Lead in ERP-led engagements. Overviews of the latest ERP implementation methods, tools and templates are balanced with the leadership skills necessary to guide mixed teams of ERP consultants, 3rd party contractors and customers. Simulations and case studies prepare functional and technical team leads for the real-life challenges they will encounter. This one-day workshop introduces the Blanchard Situational Leadership (SLII) model to managers, providing opportunities to enhance communications, diagnosis and flexibility skills. Because it opens up communications, SLII is especially effective when working with knowledge workers, whether they be colleagues, subordinates or customers. SLII invites individuals to teach managers about themselves and what kind of help they need in order to develop their competence, motivation and confidence. The workshop also introduces best practices and available resources for managing virtual teams in a multicultural environment. Copyright © 2008 OTA All rights reserved.